In 2017 the Green Seattle Partnership (GSP) made some serious on-the-ground impacts in forested parklands across Seattle. Green Seattle has the ambitious goal to restore all 2,500 acres of forested parklands by 2025, and staff knew that 2017 had to be a big year for new acres and maintenance. This bump in new acres wouldn’t have been possible without enlisting the services of professional restoration crews to work across acres that are too steep or isolated for volunteers to work on. The biggest increase this year came in the maintenance acres, jumping from 182 acres in 2016 to 322 acres of maintenance in 2017. The maintenance work isn’t as glamorous as ivy rings or trees planted, but it is critical to long term success of the program. Green Seattle also planted more native trees, shrubs, and groundcovers than ever before in program history– 164,177 plants to be exact! Of those plants, 38,194 of them were native trees, like Douglas fir and western redcedar. These plants are planted as small one gallon plants, but will grow up to be the future forest of Seattle. 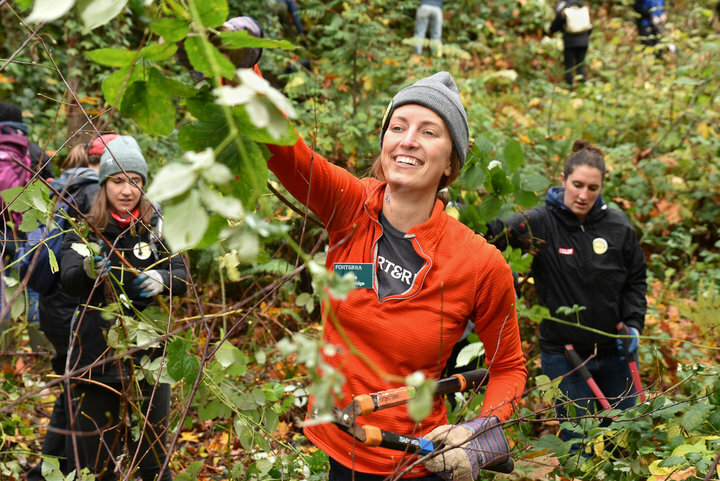 Over 1,200 volunteers, another record, came out to Green Seattle Day on Nov 4, 2017 to kick off the planting season at 20 of Green Seattle’s restoration sites. The success of Green Seattle wouldn’t be possible without the help of some amazing resident volunteers and community partners that help the program find a home in almost every neighborhood in Seattle. 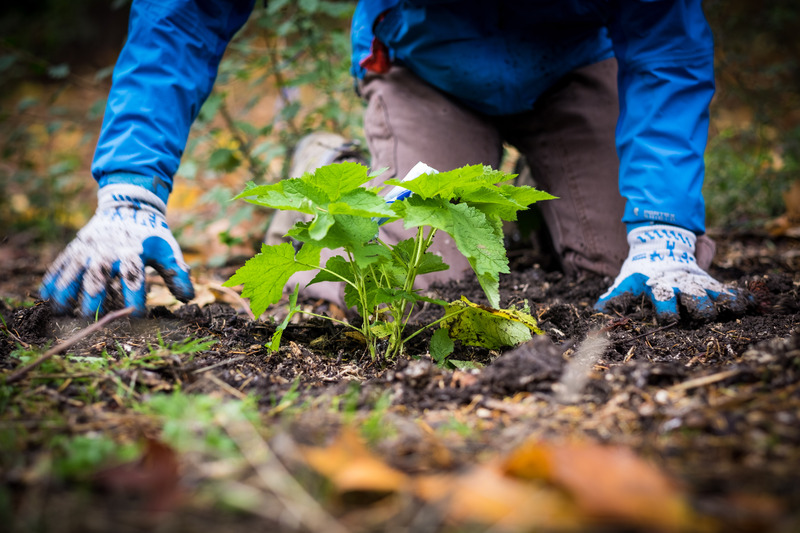 In 2017 the Green Seattle Partnership started working with the DIRT Corps at Westcrest Park, and Mountains to Sound Greenway Trust at MeKwaMooks Park. Two additional partners have also been helping Green Seattle with communications and outreach help; Broadview Planning and Cascadia Consulting. 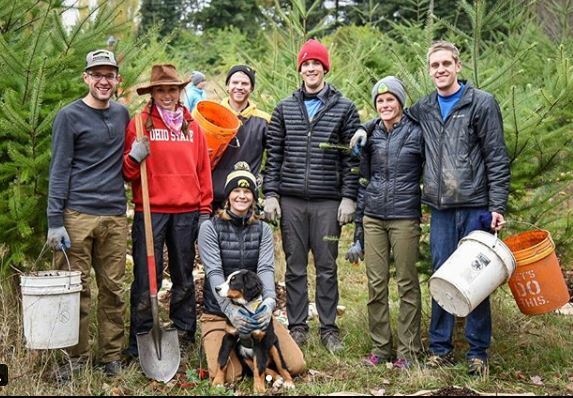 The Green Seattle Partnership trained a new cohort of volunteer Forest Stewards to help lead events; which brings the grand total of Green Seattle Forest Stewards to 170. You can meet some of these new Forest Stewards at volunteer events in their parks like Larry at Meadowbrook Park or Tim at Northacres Park. In 2017, we were also very proud to see some of the Carkeek Park Forest Stewards be awarded the Seattle Parks Denny Award for Healthy Environment. 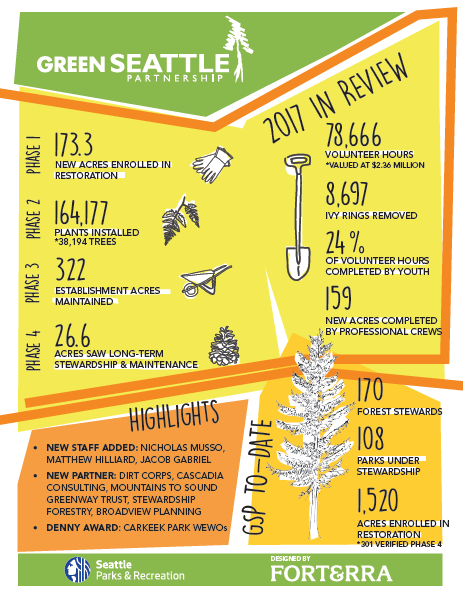 Thank you to all of the staff, contractors, partner organizations, Forest Stewards, and volunteers who helped to make 2017 such a record-breaking year! Check out the GSP Year in Review below to find out more about our 2017 accomplishments.